As recounted previously on these pages, I have been somewhat frustrated of late in my efforts to get out hiking. In particular, my urge to get out for an overnight trip. I had originally planned to do a 2 or 3 dayer to Oze Marches, but time has just run out. So instead, I thought a little trip closer to home might be a bit more practical. So with that intent I booked a couple of days off work and headed for where the WiFi can’t find me. Little did I realise that my leisurely stroll through the woods would turn into something off a Bear Grylls tv show. 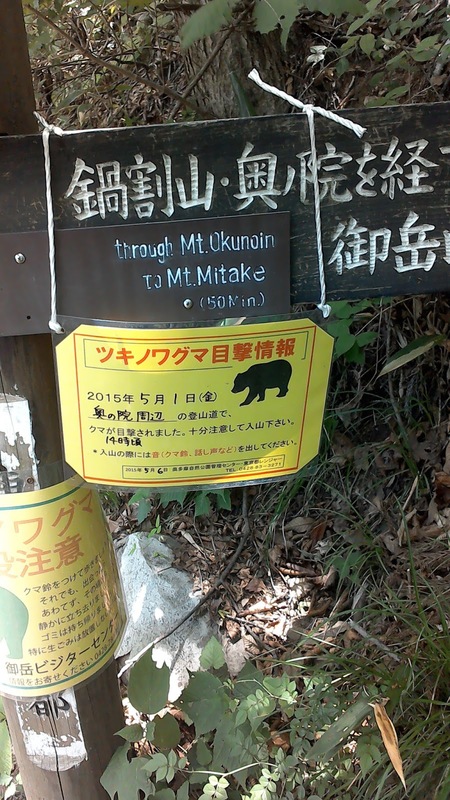 Bear activity is not unusual this time of year, and the quieter areas around Mitake are known bear haunts. The Asian black bear is a famously bad-tempered animal at the best of times. But a female with cubs is particularly dangerous, and this time of year is when cubs and their mothers are likely to be more active. Bears will normally try to avoid human contact, but being mid-week there weren’t so many people around. Travelling alone meant that I was at increased risk of a chance encounter, so I decided that sticking to one of the busier trails might be a good idea, so I continued on to Mt Otake. Well, that was unexpected. The path was seemingly quite popular one and I had seen nothing to indicate the closure up to that point. 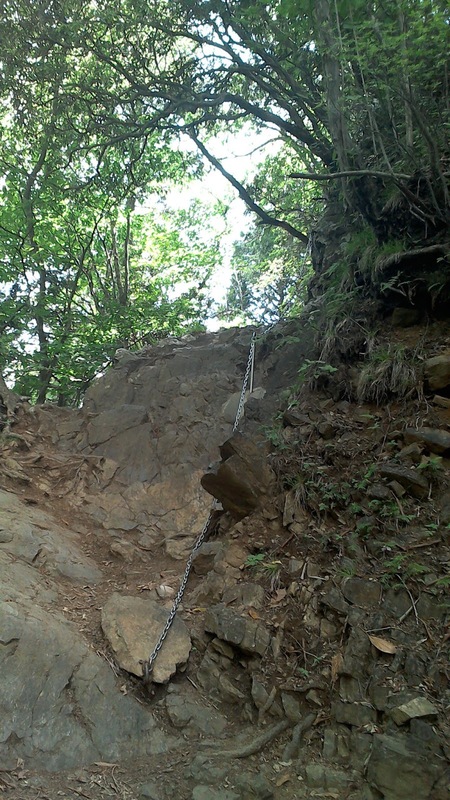 There was a notice posted on the Oku Tama Visitor centre website that one path was closed for maintenance, but the location given was further south. But whatever…now I had a bit of a problem. To continue south would take me way off course and dump me miles away from my destination, with nowhere to go. Doubling back was an option, but difficult. The detour would take me 10km or more out of my way, and involve tackling what looked like a difficult and unfamiliar scree descent in the dark. I didn’t fancy that either. There was no other way to reach my destination, so I had to make a decision: return to Mitake and abandon trip or to trust to my map reading skills and common sense and try to find a way through the closed trail. I decided to take a chance. Trails are usually closed for either maintenance or logging operations. I figured that in either case, the actual site of the works was likely to be quite small. From the map, I could see that the path had a couple of steep-ish descents, but nothing dangerously so. I couldn’t hear any machinery or chainsaws, so I reasoned that if I could navigate around the area of disruption, I’d be fine. I was heading into a valley, and off in the distance I could hear water. Water flows downhill, and usually eventually leads to a road or some form of settlement. I appeared to be following the right general direction and the features I could see around me matched what the map was saying. But nevertheless, I needed to consider my options. I was well equipped. I had food and shelter. If necessary, I could survive an overnight stay quite comfortably. I felt sure of my map and compass, and I was confident I had a reasonably good idea of my location. My biggest worry was getting injured – either breaking a leg, being clumped by a falling rock or running across one of Japan’s poisonous snakes in the undergrowth. In the latter case, I was quite happy that my noisy descent should alert any animal to me presence long before I arrived, so trying to avoid injury became top priority. Previous Post A hidden threat to health?